I have been working in wetlands since 1979 and have been surveying aquatic and wetland plants since 1994, this developed from needing to learn plant identification for work into a fascination with the taxonomy, identification, ecology and conservation of wetland-dependent plants. I have surveyed most of the river SSSIs in Britain, as well as many unprotected rivers. Most river plant survey methods require the ability to record not only the vascular plants occurring along water courses but the bryophytes, lichens and macro-algae. Working to learn these species, I compiled information on the identification of the more difficult and cirtical groups to the extent that I was able to produce a guide to the identification of all the plants likely to be encountered within the inundation zones of rivers in Britain and Ireland (see the bottom of this page) and which can be reliably identified in the field. The difficulties of identiyfing lichens meant that this section is limited to a list of species likely to be encountered in this habitat. My interest in identification continues and I continue to compile information on aquatic and wetland plants, not just in Britain and Ireland but throughout the world. Linked to the work of the IUCN SSC Freshwater Plant Specialist Group and initiated with funding from BioFresh, I am working on a global list of wetland-dependent plants and now have a library including more than 200 aquatic plant identification guides and floras, as well as hundreds of reports and journal articles which support the surveys and other work that I do on these plants. I have also applied most of the available standardised survey methods involving recording plants for flowing and standing waters in Britian, including involvement in a government test of various methods toward revising the current protocol for Condition Assessment of UK Rivers. I also participated in a multi-observer trial of river macrophyte surveys which formed the basis of a chapter in the book Conservation monitoring in freshwater habitats: A practical guide and case studies by Hurford, Schneider and Cowx in 2010. 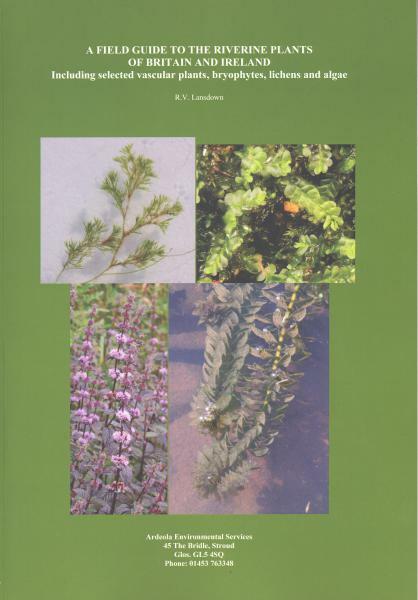 This guide is designed as a source book for surveyors using standard river plant survey methods such as the JNCC macrophyte survey, Mean Trophic Ranking, LEAFPACS or even River Corridor Survey and has been designed to support training in riverine plant identification. Dichotomous keys are provided to identify more than 900 taxa, including all the vascular plants and bryophytes likely to be encountered within the river recording zone, as well as information on most algae and a list of the lichen taxa that may occur along UK rivers. This information is supported by a suite of glossaries, as well as more than 150 line drawings and a small number of black and white photographs. In addition to information to aid identification, the guide includes information on collection and preservation of voucher material, as well as lists of protected and alien riverine plants.